The best part of being pregnant is that now I know everything. Before I got pregnant, I was really interested in science, child psychology and child development, and I always kept up on the latest trends. I babysat all through high school and college, and I have always kind of missed it, so I kept up on baby and kid stuff like it's a hobby. Plus, being a travel agent who specializes in Disney means keeping up on all kinds of things that I wouldn't otherwise pay attention to as a childless adult. Every trip to the World is a prime opportunity to do stroller and babywearing research! Being pregnant makes you an expert! I see it all the time on internet baby boards: first time moms complaining about their "childless" friends offering advice. Isn't it a miracle how simply getting pregnant makes you an expert? I'm so excited! 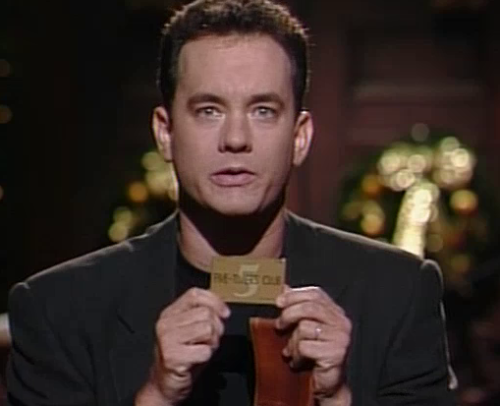 I feel like Tom Hanks joining the Five Timers Club. To be fair, in the 2 months I knew I was pregnant and not many people knew, I discovered that the reason you become an expert is that there's nothing else to do. If you want to obsess about being pregnant, your only option is to studying breastfeeding and diapers like it's a college exam. So when someone tries to give you their opinion, you're all "Whatever, I got an A in this class already." Childless friends, you are welcome to punch me if I make that J-Law face at you.